Dairy kefir grains can be used to make quick and consistently delicious cultured sauerkraut. 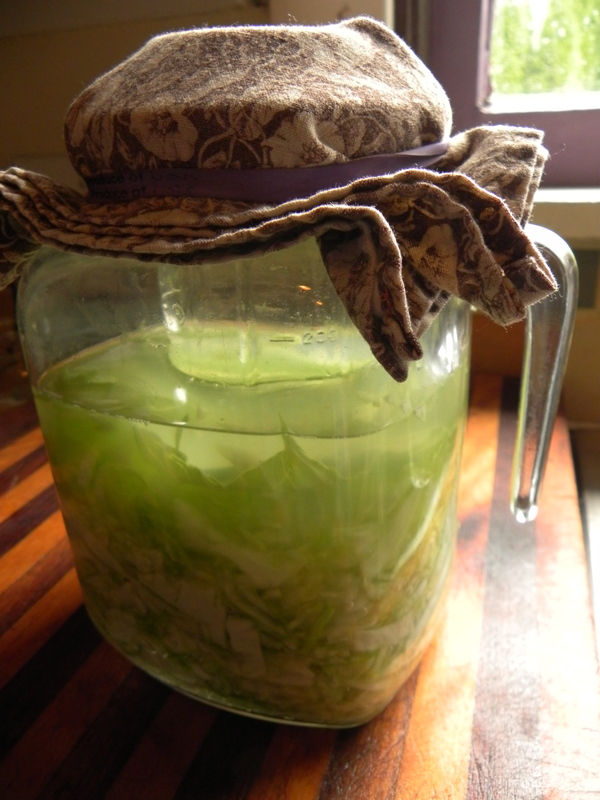 The kefir grains act as a starter culture for the cabbage, the ‘kraut ferments for just 2-3 days, and the results are predictable: tangy, crunchy, and palate pleasing. To preserve the probiotic content, heat raw, cultured sauerkraut to no more than 110 degrees F. Serve as a garnish to savory dishes like baked beans, vegetable or lentil salads, roasted meats, or stir-fries. This recipe is inspired by Dom’s Kefirkraut recipe. Prepare a half-gallon (or one-gallon) wide-mouth glass jar by washing it in hot soapy water (use soap, not detergent). Remove any wilted or discolored outer leaves on the cabbage. Discard them. Peel off one crisp outer leaf. Trim it one-inch larger than the diameter of the jar. Set it aside to be used later as a cover for the sauerkraut. Use a chef’s knife to half, core, and thinly slice the cabbage. Place one quarter of the sliced cabbage in a large bowl. Sprinkle with one quarter of the salt. Use a large wooden pestle, kraut pounder, or the flat end of a meat hammer to bruise the cabbage leaves. When the vegetables have been thoroughly bruised, add another quarter of the cabbage. Sprinkle with another quarter of the salt. Repeat the bruising process with the remaining cabbage and salt. Place one half of the kefir grains in the bottom of the prepared jar. Add one half of the cabbage. Press down firmly with your pestle, pounder, or hammer. 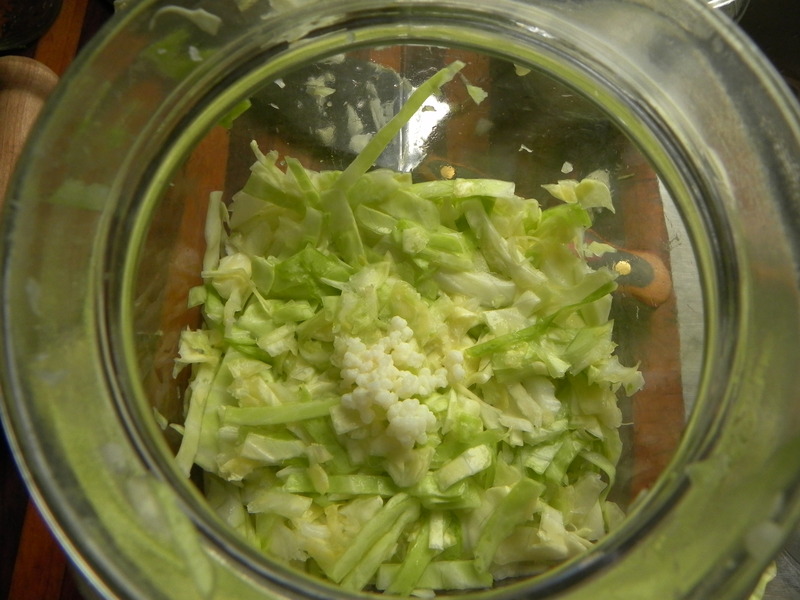 Evenly compact the cabbage within the jar. Add the remaining kefir grains. Then add the remaining cabbage. Again, press down to evenly compact the mixture. Cover the shredded cabbage with the reserved cabbage leaf. Tuck the edges of the leaf into the sides of the jar. Add a weight heavy enough to hold the cover leaf in place (see cooks notes). Add enough water to cover the top of the sauerkraut by one inch. Cover the top of the jar with a cloth or paper towel. Secure the cover tightly with a rubber band or string. Store at room temperature (about 65-75 degrees F) until the kraut smells and tastes pleasingly tangy, about 2-3 days. Skim any foam that rises to the top during the fermentation period. If the liquid evaporates, add water to keep the sauerkraut covered by one inch. Store tightly covered in the refrigerator. The taste of kefir kraut is stable for two weeks. After 2 weeks of storage it becomes increasingly, though pleasantly, tart. Eat within one month. To prepare kefir grains for making sauerkraut rinse them in water until it runs clear. No traces of milk should remain. If it fits through the opening in the sauerkraut jar, a pint-sized mason jar, filled with water, and capped tightly may be used as the weight. To use a stone as a weight for fermentation, select one that is non-porous, relatively heavy and flat, and fits easily through the mouth of your fermentation jar. Scrub the stone with hot soapy water. Then, sanitize it by dropping it into a pan of boiling water for 2 minutes (alternately, drop the stone into the silverware tray of the dishwasher and sanitize it with the next load of dishes). This recipe was shared on Fat-Tuesdays, Slightly Indulgent Tuesdays, Hearth & Soul Hop, Real Food Wednesday, and at the Probiotic Food Challenge. I have been wanting to try making my own sauerkraut! This sounds delicious! Thank you for sharing this with the Hearth and Soul Hop. What do you do with the kefir grains when the sour kraut is done? Enter your email address to subscribe to this blog and receive all new-posts email.